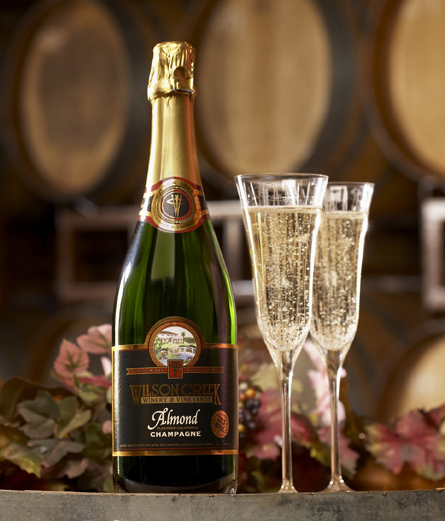 What do Temecula Valley’s Wine Country and Wilson Creek Winery have in common? They are home to the famous,”Oh My Gosh” Almond Champagne! If you’ve never had it, you HAVE to try it! If you’ve had it, then you know what I’m talking about. We call it the “Oh My Gosh” champagne because that is the typical impression a person gets when trying it for the first time. This stuff is so good that people from all over the country have it shipped out for special occasions and everyday happenings alike. Definitely a popular choice for wedding toasts, I know a couple who drove from central California to Temecula just to fill their convertible Mini Cooper to the brim with cases of Almond Champagne for their daughter’s wedding. Now if that isn’t love, I don’t know what is! Almond champagne is wonderful on its own, but goes great with other things as well. Next time you’re in the area and decide to visit us try the Almond-tini in a chocolate cup. A favorite around here, the Almond-tini is Almond Champagne mixed with a bit of our Decadencia (chocolate port dessert wine), served in an edible Dutch chocolate shot glass – Salut! Then there’s the Almond Slushie, our version of a frozen margarita, so to speak, minus the tequilla, add Almond Champagne and voila! The Almond Slushies are heaven-sent in the warm, Temecula summer months. We love this champagne so much that we wanted to make it easy for you to get no matter where you are. So now you can find our Almond Champagne, along with our Peach Bellini (Almond Champagne and natural peach flavorings) and Orange Mimosa (Almond Champagne and natural orange flavorings), in 23 states! If you’re a California resident you may see us on the shelves of a Costco, Vons, BevMo, Albertson’s, and Walmart (to name a few) near you. This entry was posted in Wine Musings and tagged Almond Champagne, champagne, Temecula, Wilson Creek, Wine, Winery. Bookmark the permalink.